Microsoft officially launched their Windows Azure infrastructure as a service (IaaS) offering a few weeks ago — officially dubbed Windows Azure Infrastructure Services — a move which now puts them squarely in competition with Amazon Web Services for cloud IaaS market dominance. Amazon is clearly the leader in this area, but Microsoft is entering the market with some aggressive pricing and an impressive set of features. Some interesting examples of Windows Azure IaaS in operation have started to appear already, but perhaps none are as entertaining as watching IT expert and SavillTech founder John Savill show viewers how to spin up a multiplayer Minecraft server using Azure IaaS. Create a Windows Azure free trial account. Create a new Windows Server 2012 datacenter edition virtual machine using Azure’s gallery of VM templates. Give the new VM a unique DNS name, finish provisioning it, and add a 100GB disk. Connect to your new VM using remote desktop protocol (RDP). Azure provides a properly-configured RDP file for your VM. In the Windows Server 2012 datacenter edition VM, install the 64-bit version of Java. Download and install the Minecraft server. Setup and configure the Minecraft server; make sure server is accessible through firewall. Savill was willing to answer a few questions about his Minecraft install via email. What follows is an edited version of our email interview. Q. Are you an avid Minecraft player? How did you get introduced to Minecraft? A. My son is an avid player so this server was really for him. I did play on the XBOX 360 version and recreated my house and built a rail track that went the entire way ’round the top of the world and looped all the way under it. It can be very relaxing, but it also takes up way too much time. Q. 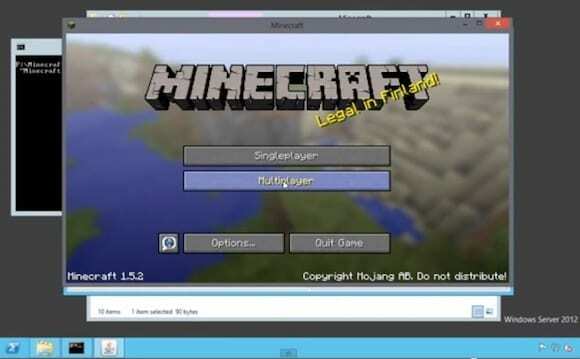 What made you pick Minecraft as an example for your Windows Azure IaaS demo? Q. Setting up Minecraft in an Azure IaaS server seems like fun, but what are some of your favorite productivity apps/services you’ve put into the cloud using Azure IaaS? A. Right now I see a lot of people using Azure IaaS for development environments; however, now that Azure IaaS has hit GA and is fully supported, I’m seeing a lot more customers looking to move production workloads to Azure IaaS. It seems to be the less critical systems, so companies can test the water and gain confidence, but I think over time there will be a lot more. I think the fact that Azure IaaS is compatible with on-premise Hyper-V will make it very attractive as workloads can easily be moved on and off premise. Q. Have you used Amazon Web Services as well? If so, how would you say the two compare? A. I’ve never really used AWS to any level to give a real good comparison. Q. What advice would you give IT pros when it comes to considering what to put in the cloud with Azure IaaS? A. My guidance would be to start out small. Create some test virtual machines and understand the capabilities. Make sure you realize you are paying for the virtual machine whether it is running or not, so don’t just go and create a bunch of virtual machines you don’t really want but think because they are turned off you are not getting charged. You are! Consider what other services an application needs as to its suitability for placing in the cloud and remember you still need to manage it. IaaS is really just giving you a VM. You still need to patch it, manage it, and protect it so make sure you still have good processes in place for management. Consider if services in Azure IaaS need to communicate to your internal network as there are now some great ways to securely link your Azure services to your internal network.